A glass jar filled with home-made cookies is a must in each and every kitchen. 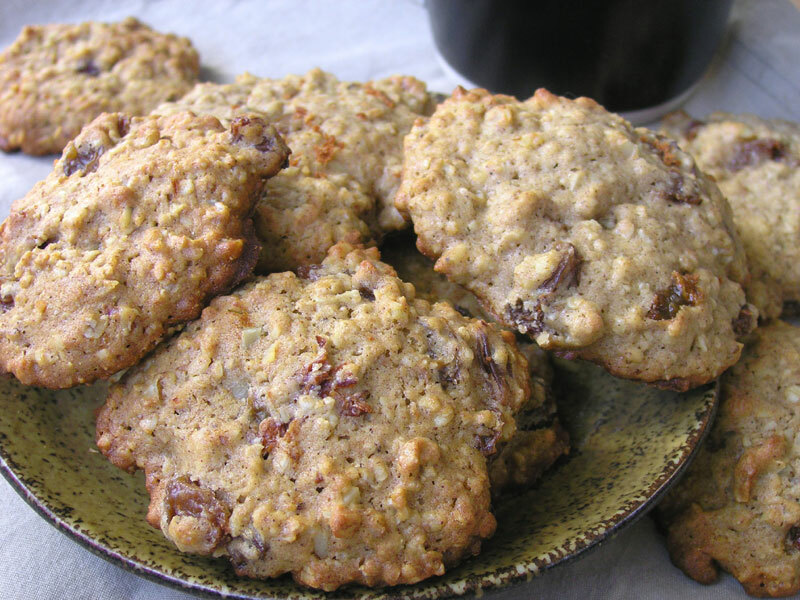 And what could be better than a jar of healthy, old fashioned Oatmeal Cookies? While working on bringing my dream to life, I browse through numerous recipes and spend hours turning good ingredients into bad baking experiments, until I found this recipe. Since then, I always have a jar, filled with tasty home-made cookies in my kitchen. Cook raisins in just enough boiling water to cover for 5 minutes. Drain, reserving 6 table spoons of liquid. Melt ghee with sugar, add eggs, beat the mixture until smooth. Add raisins liquid. Combine flour with soda and spices, add oatmeal. Add to butter mixture. Add raisins, chopped dates and chopped nuts. Using tea spoon, drop on greased cooking sheets, flatten a bit, and bake in 400F oven for 10-12 minutes. If you happen not to have oatmeal flour at home you may use spelt flour, or 1 cup of unbleached white flour and 1 cup of whole wheat flour, or 1 cup of spelt flour and 1 cup of whole wheat flour. I am definitely not gluten free, but a firm believer that modern highly refined, bleached white flour is not something we should pack ourselves with. I think that ancient spelt, rye and oatmeal flours are much healthier options and I use them instead of white flour whenever possible.